"Concealed (In 1-3/4" Tube) Mounting - Single Lever Arm"
- Closer Size: 2035 (Size 5). - Delivery: The LCN 2035-STD-AL-LH Concealed Closer is In Stock and available to ship. The concealed LCN closers feature a modern design for concealment in either the head frame or top rail of the door. 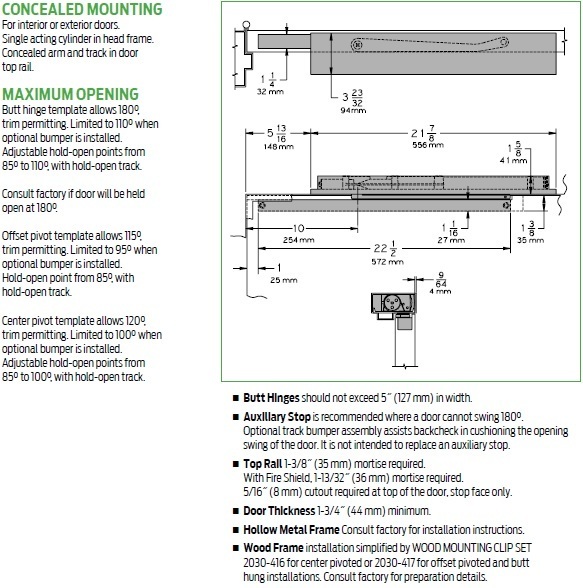 The concealed LCN 2030 Series PACER® is a heavy duty closer designed to fit in a narrow, minimum 1-3/4" aluminum transom. The single lever arm and roller assembly provide smooth, quiet door control and the choice of finishes and track functions meet virtually all architectural requirements. 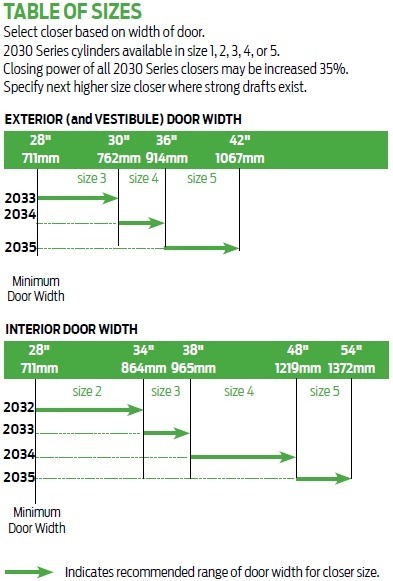 The 2030 Series is UL & cUL listed for self-closing doors, without hold-open. Test and certified under ANSI Standard A156.4, grade one. - Standard 2030 Series closer shipped with standard arm, security track, mounting/finish plate, and wood and machine screw pack. - Sized cylinders for interior doors to 4'6" and exterior doors to 3'6". 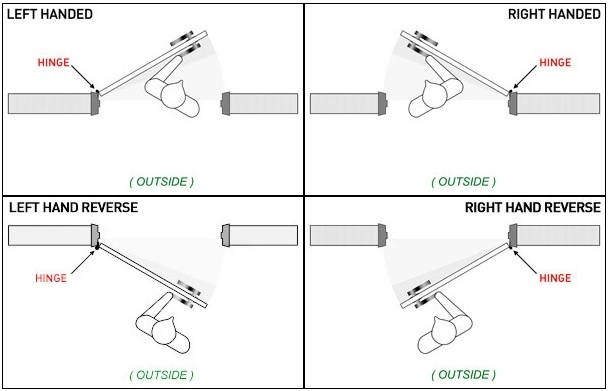 Click here for Cylinder Size Table. - Aluminum frame requires minimum 1-3/4" (44mm) x 4" (102mm) tube. - 2035: Exterior Door Width - Size 5 (36" - 42"); Interior (48" - 54"). STD (Standard Track 2030-3038): Standard, non hold-open, non-handed track. Will accept hold-open clip and/or bumper assembly. Special Order Information: For pricing on any finish or non-standard option of the LCN 2030 Series Closers not found on this page please contact Taylor Security direct via e-mail (sales@taylorsecurity.com) or call us toll-free at 1-800-676-7670.